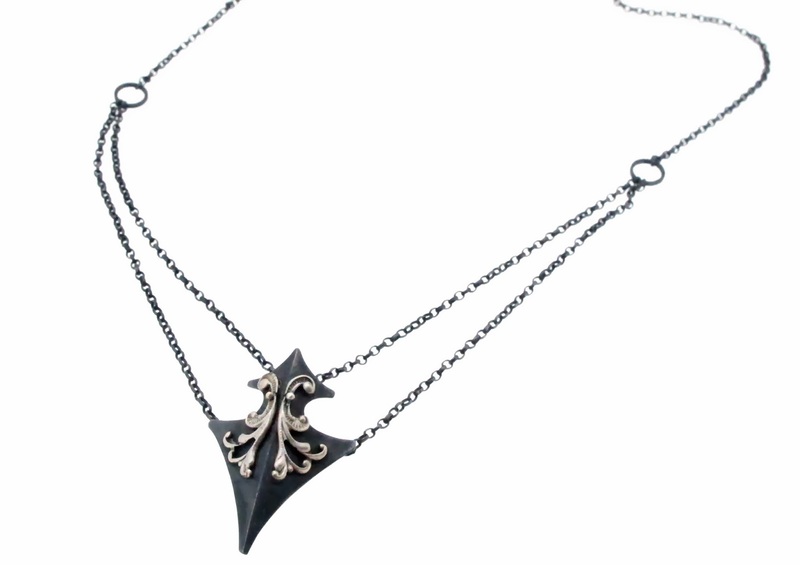 A tragic love story, romantic detail and Arthurian legend create the bold new collection from Sian Bostwick Jewellery. Inspired by the tragic 12th century love story of the adulterous affair between the Cornish knight Tristan and the Irish princess Iseult. Falling prey to a wicked love potion Tristan & Iseult are compelled in to a love triangle with king Mark, betraying his trust and faith. Tristan's knights armour becomes a bold edgy ring and necklace whilst his shield, used to battle the giant Morholt, inspires the shield earrings, ring and necklace. Complementing these pieces is Tristan's Cornish knights of the round table company ring. The strong edgy forms of Tristan's shield, armour and knights ring are stunningly high impact, fashion focused jewellery with the beauty and tragedy of Tristan & Iseult love story. 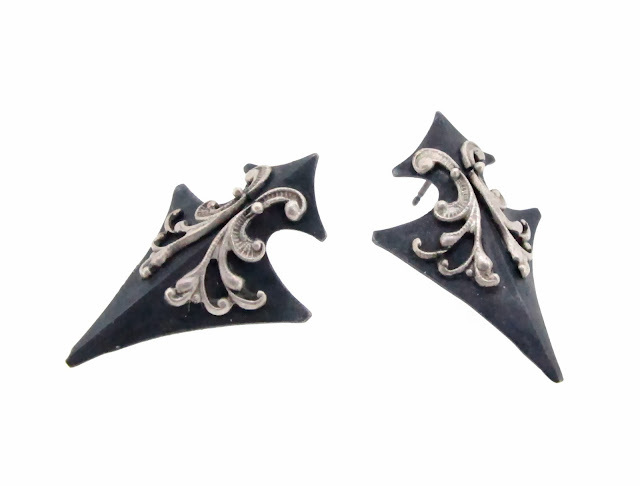 The collection features bold black oxidised silver with highlighted detail in silver, strong masculine forms contrast with the fine detail influenced by the Victorian art created around the legend. The collection will have 2 parts with the accompanying Iseult jewellery pieces mirroring Tristan's jewels with more delicate detail and forms. Iseult's jewellery is yet to launch and will complete the Tristan & Iseult collection. Sian Bostwick creates award winning jewellery inspired by a love of fairytales, wondrous literature and mysterious story's. Drawing on treasured tales such as Alice in Wonderland, tales of enchanted woodlands and fairy glades, 20,00 Leagues under the sea and Tristan & Iseult to create beautifully crafted jewellery with intricate detail and a touch of wonderland. Each piece of jewellery has its own story to tell.